In August 2014, Tiffany Tate was working in the Medical College of Wisconsin cafeteria at a Milwaukee hospital when she suffered a stroke. At that moment she was only a few hundred yards away from Froedtert Hospital’s emergency department which includes a premier stroke center. However, she was not transported there due to the fact that the hospital’s emergency room was on diversion at the time. Instead, she was driven to a hospital farther away. The stroke care she received there immediately was not up to par with the care she would have received at Froedtert. In fact, it took several hours for Tate to receive the level of care she would have received had she been transported only a few hundred yards to the highly capable stroke center. Sadly Tate, the mother of two, died four months later. Her death has brought to the forefront the debatable practice referred to as ambulance diversion, in which patients transported by ambulances are taken to hospital emergency departments that are not necessarily the shortest distance away in terms of time. The reason this sometimes occurs is that many hospital emergency rooms have been permitted to claim they have no room or capacity to treat additional patients. The question is: Can this practice lead to medical malpractice? The majority of ambulance diversions happen due to the inability of emergency room personnel to transfer current patients to other designated rooms and hospital beds. What occurs is a backlog of patients that are held in the emergency room for prolonged periods of time, preventing additional critically injured patients from coming in to receive care. Hospitals facing these backlogs sometimes use ambulance diversion to simply stop the flow of new patients until the backlog is cleared. The Capital is no stranger to overcrowding, either. Ambulance diversion has been allowed since 2008, and a new program has registered nurses processing “live calls in a program aimed at reducing the crush of non-emergency medical requests that swamp the 911 system in the District,” per the Washington Post. About 70% of all ambulance calls are for non-emergencies, the Post reports, and this new program will team up with Lyft or local taxis to direct patients to the appropriate doctor. Ambulance diversion is treated in different ways in different parts of the country. In some places it has been utilized extensively. Other hospital systems reject the practice. There are some places in the country that utilize the practice to a limited degree; for instance, only when emergency departments are full. Hospitals can become overwhelmed and at times choose not to receive additional emergency patients. In some cases when there are not enough inpatient beds, authorities allow hospitals to prevent further emergency visitors. Sadly, in Milwaukee County, hospital authorities were in the process of eliminating the practice of ambulance diversion when Tiffany Tate suffered her stroke. Since then, Milwaukee hospitals have eliminated diversions by making their whole operations, not just the emergency departments, more efficient. The practice of diversion increases the time it takes to transport a patient to the urgent destination, the hospital’s emergency center. As a result, the patient is delayed from receiving critical care. These delays can have life-changing consequences, particularly for patients who have suffered serious medical events, such as stroke, respiratory failure, or heart attack. Ambulance diversion has a cascading effect within the broader emergency medical system. When ambulances travel for a longer period of time to reach a hospital destination, the emergency medical personnel on these trips are delayed from moving on to the next emergency. As a result, those in the general public seeking emergency services at that moment may experience a delayed response due to potential limited ambulance availability at that moment. 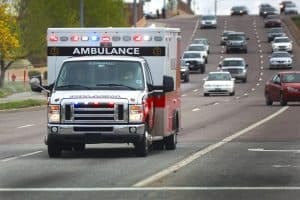 So, how do we assign liability for harm incurred to a patient whose transfer to an emergency medical center for care has been delayed due to ambulance diversion? Is the emergency room staff to blame? What about the doctors, nurses and hospital administrators, emergency room charge nurse, and hospital policymaker? The answer is that each case must be adjudicated on its own merits. A seasoned medical malpractice lawyer can conduct a serious investigation into your case and determine what party is responsible for the lack of prompt care provided to you or a loved one, leading to serious illness or injury.